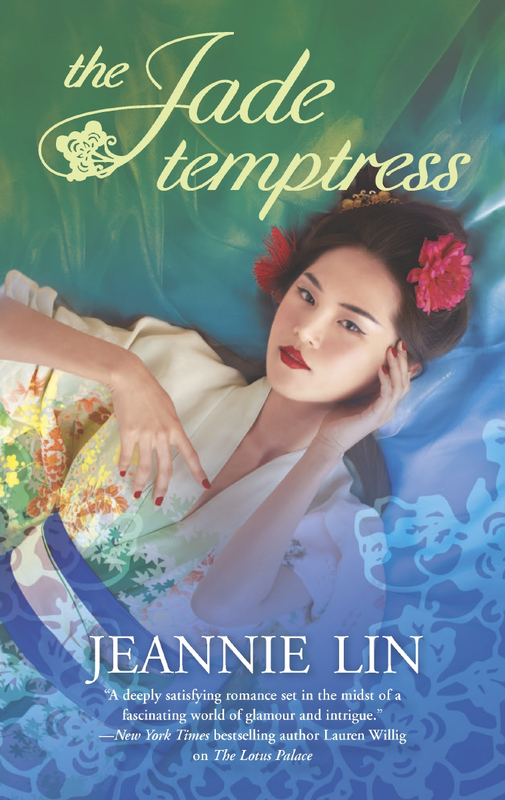 As a sword dancer and a famous thief-catcher play a cat and mouse game across the city streets and rooftops of imperial China, the one suspect that Thief-catcher Han cannot capture turns out to be the only woman he wants to hold on to. “Heaven and earth moved in tune with her rhythm. The sword flashed like Yi’s arrows that shot down the nine suns. Tang Dynasty China, 848 A.D.
A lone reed flute sang the opening melody. It was enough to hush the gathered crowd into silence. A dancer stood, still and patient, at the center of the circle. 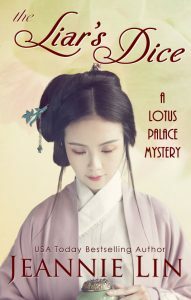 The long sword poised in her hand captured the sunlight as an intermittent breeze fluttered through the peach blossom silk of her tunic. It was as if nature had aligned itself with her for this performance. There was stillness again before the melody swelled. The musicians were situated at the edge of the clearing, blending into the crowd. All focus was on the dancer. The young woman gradually lifted one foot; knee curved outward, toes exquisitely pointed. Her free hand took on a classic lotus shape. Her expression remained tranquil. She held the position effortlessly, the graceful lines of her body belying the strength and discipline in the pose. 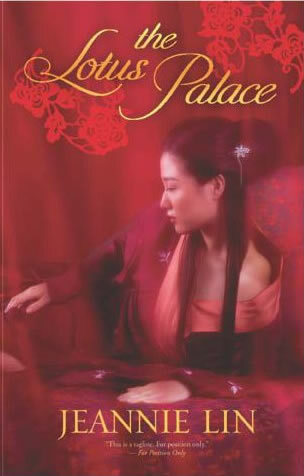 Zheng Hao Han eyed the sword in her grasp. Its presence added a hint of tension and drama, and the crowd waited eagerly for the dancer to fulfill the promise. Performance troupes such as this one traveled from city to city and always drew a crowd. Han scowled at the snide remark. His newfound fame was an ill-fitted garment he was forced to wear. Longxu earned his nickname from the dragonbeard hook that he roped around his quarry with stunning accuracy. They had worked together in the past, splitting the reward for apprehending dangerous criminals that the local magistrates and constables were ill-equipped to handle. Han wouldn’t say that they were partners in this venture. Longxu had the nose of a scavenger, eager to feed off of someone else’s catch. He had encountered Han on the road and immediately chained himself to his side. They weren’t the only thief-catchers in the crowd. The amount of money offered for this case had lured many fortune-seeking mercenaries. All of them had followed the same lead to this remote village within the rugged hills of Fujian province. A shipment of jade and gold had been stolen from a security warehouse a few counties over. The magistrate had issued an arrest warrant that singled out a band of traveling performers as the culprits, unlikely as that seemed. Han scanned the musicians and dancers at the center of the market square. Longxu was right about one thing. These weren’t the sort of bandits he usually dealt with. An explosion of drums shook the street and the audience leaned in close, clamoring for a better view, as the dancer leapt into motion. This was no soft seduction of willowy arms and flowing silk. Her technique was sharp, precise, and powerful as she executed sword forms one might see in a fighting drill. She extended her limbs through each movement, exaggerating and accentuating the beauty of the underlying structure. Han chose not to answer. He would rather concentrate on the sword-dancer than bicker with small-minded vagabonds. 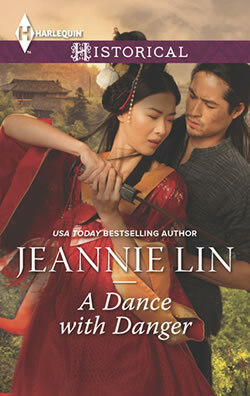 There was no doubt that what they were seeing was a performance, yet there was something in the dancer’s stance and her grip on the sword that triggered some instinct within him. With each thrust of the sword, his pulse rose. With each lunge and leap, his heart beat faster. It was the essence of the sword dance, the balance of contrasting elements. The hardness of the warrior techniques served to highlight the sensuality of the dance. He was enchanted by the suppleness of an exposed wrist. Enthralled by the hint of rounded calves and gently curved thighs beneath the flowing costume. The dancer’s eyes met his at the end of a turn and his heart forgot to beat. Han kept his expression blank as he returned her gaze. Her skin was glistening, her cheeks flushed. After the brief pause, she moved on and Han swallowed past a sudden dryness in his throat. The rival thief-catcher had also stopped talking to stare, the same as every other man in the audience. Han needed to focus, maintain a critical eye. He was here to complete a job, not to be charmed by a dancing girl. The drummers transitioned to a quicker tempo, beating out a driving rhythm as the dancer took to the air. The sword flowed with her, the flash of the blade highlighting each turn while the audience murmured with excitement. To everyone else, the sword dancer’s movements were nothing more than a performance, but the underlying technique caught Han’s attention. There was training there. Years and years of training. Not something one usually found at a dusty street fair in some back road town. At last the penetrating rhythm fell away to the soft refrain of the flute. The melody floated through like clouds parting to calm the storm. The sword dance took on a peaceful, almost languid quality before dropping back into stillness. The crowd erupted into applause and the dancer took a graceful bow, sword tucked carefully along one arm, as the troupe sent their minions through the crowd to collect coins. A commotion erupted among the musicians. A few of the thief-catchers had become over-eager and were moving in, shouting and attempting to make arrests. Han shook his head in exasperation. A few of the entertainers started shoving through the crowd in an attempt to break free. A sword was drawn from somewhere within the chaos and suddenly everyone was in full motion like ants on a hill. His first inclination was to back away. There was too much confusion and he wasn’t even clear who the suspects were, but a flutter of rose streaked with gold and green caught his eye. The sword-dancer. Her, his thief-catching instinct shouted. Instinct was all it took to set him into motion. She wove through the crowd and ducked into the tavern across the street, slicing through the beaded curtain. Han followed, but the strings of beads swung and tangled around him. By the time he shoved through, the dancer was flying up the stairs. He pushed past startled customers to bound up the steps after her. He crashed into a server at the top, sending a tea tray and a stack of cups flying. Before he could recover, a sword came at him. Han side-stepped and tried to lock onto her wrist as the blade slid by, but the sword-dancer evaded his grasp, her movements as fluid now as they were during the performance. A cry came from the customers as they stood and skirted to the edges of the room. The sword was aimed at him again. 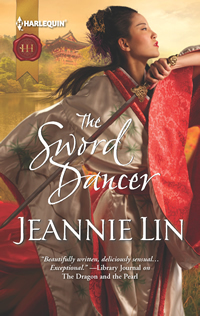 The dancer wielded a jian, its long, thin blade suited for the precision cuts and jabs of the more artful duelists. The weapon itself was fake, the edges dulled, but the skill behind it was very real. Han unsheathed his dao and blocked in a single motion. His blade was heavier by comparison, suited for the swift, decisive attack of a battlefield. The sword dancer avoided the swing of his blade, attacking into the opening it created. Strategy, controlled-breathing, eyes sharply focused without a hint of fear. Han struck at the sword rather than the fighter, using force and momentum to twist the blade out of her hands. There was no time to celebrate as the dancer grabbed a plate and flung it at his head. Followed by a wine jug which shattered overhead as he ducked. Followed by a wooden bench. Heaven and Earth, she fought like a demon. The dancer ran over the tables rather than weaving around them. By the time he shoved the bench away, she had dived out the window. Han raced out onto the exterior balcony to find it empty. He peered down below into a similarly deserted street. She’d somehow landed and disappeared into an alleyway. A furtive shuffle overhead told him differently. He stilled, head tilted to listen. There it was, the faint pad of footsteps. She’d gone up, not down. Han shoved the dao back into its scabbard and climbed on top of the rail. From there, he grabbed onto the looped carvings that ran along the eaves and used them to hoist himself up onto the roof. The dancer was already at the far end of the rooftop. With a running leap, she sailed across the alley onto the adjacent rooftop, the ribbons of her costume floating behind her like the long feathers of an exotic bird. The heat of the chase was upon him. He followed her trail, running hard and jumping just before the edge. Gray tile cracked beneath his feet as he landed. He had some experience chasing criminals through winding streets, but this was entirely different. The city below disappeared and the rooftops became a new, uncharted landscape. The dancer leapt again and again he followed. The rooftop sloped upward and she disappeared over the rise. The sun was high overhead and as Han began the upward climb, he was momentarily blinded by the glare of it. Suddenly a pink blur whirled toward him, followed by the snap of a well-placed kick at his mid-section. The impact knocked him back. He landed with a thud and started to slide. His hands clawed over the slate tiles. He hit the edge and his stomach plummeted just as a something closed over his wrist, stopping his fall. Han looked up, stunned. It was the sword dancer. Her feet were braced against the raised edge and the muscles of her arms strained against his weight as he dangled partially over the street below. Their gazes locked. It was only a moment, a blink, a breath. Her eyes were black and luminous beneath the dark lining of make-up. They narrowed on him in challenge. She let go of him and was again in flight. Han hoisted himself back onto the rooftop and struggled to his feet. The dancer slipped over the edge, but rather than dropping to the street, she hung by the grip of her fingers and swung into an open window that wasn’t much larger than she was. Her training had made her as surefooted and daring as a cat. Han suspected it was more than just acrobatics or dance. He leapt onto a lower rooftop then searched around, found a wagon below and landed in back among sacks of grain. This was now familiar territory. In his head, he’d mapped out the area and tracked the dancer’s speed and direction. Sure enough, he caught up to her as she darted behind a shop. Earthen walls rose high on either side of them. Longxu appeared at the far end of the alley with his hook and rope in hand. The dancer paused mid-step. Han seized the opportunity and grabbed her, clamping both arms around her torso. She was strong for her size, long-limbed and wiry, and she fought like a wild animal in his grasp. “I won’t hurt you,” he said through his teeth. Her knuckles caught the bridge of his nose in a bright flash of pain, but he held on and managed to wrestle her arms down. “You ran,” he pointed out. “You were chasing me!” she snapped. She had fled the moment the thief-catchers had made themselves known. It made her immediately suspicious. Han had her trapped against his chest and, now that she was turned, their position disturbingly resembled a lover’s embrace except that every muscle in her was coiled and ready to break free the at the first opportunity. The dancer stilled. Her gaze moving over his face as if him seeing him for the first time. “Thief-catcher Han?” she asked incredulously. “That is how I’m known,” he replied. Apparently he’d made a name for himself, though not any name his family would be proud of. 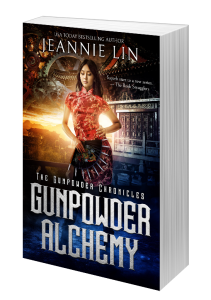 Han shifted his grip, taking a hold of the dancer’s wrist and locking it behind her back. This time she didn’t resist. Han did feel quite the bully. She was slight of build and deceptively delicate in his grasp, but she was no ordinary dancer. She’d been formally trained in the fighting arts which meant she deserved some respect…and caution. “Wen Li Feng,” the dancer said. The clerk looked her over with morbid interest. She glared back at him and he shrank back, writing down her name quickly. The prison was built much like a stable with a separate pen for prisoners and vents cut into the walls for light and air. Infractions were punished swiftly and there was no need to hold prisoners for any length of time. The constable relied on shackles and other heavy restraints to keep prisoners in line. Han clamped irons over the dancer’s wrists, forgoing the cangue, a heavy board which was locked around the neck to trap a prisoner’s head. She was a woman after all. Tomorrow she would be transported to Taining where the crime had occurred. Her reply was spoken without emotion, but something flickered beneath the calm surface of her face. It wasn’t just the skill with which she wielded a sword that had him convinced otherwise. The inner calm and confidence she exuded during their battle and the subsequent chase didn’t come without discipline. “I’m not a thief,” she stated evenly. Not many realized it, but Han had more knowledge of how the judicial halls operated than he had use for. The dancer wasn’t acting guilty, but she wasn’t quite acting innocent either. Not that it was his place to determine guilt or innocence. That was for the magistrate in Taining to decide. The constable had finished transferring the other prisoners into a single cell. The dancer was the lone female who had been captured. Han had a feeling the others were harmless performers, but Wen Li Feng was something very different. She’d fought ruthlessly, as if her life depended on it. But when he’d lost his balance on the rooftop, when she could have made her escape, she had reached out to stop his fall instead. That debt hung over him and he didn’t quite know what to do with it. Han wasn’t one to be swayed by the pleas or protests of his targets. He caught the criminals and brought them in. Yet the sword-dancer was neither pleading nor protesting. His last vision was of her looking around the holding cell, her hands weighted down by thick chains that appeared grotesque and imposing over such a graceful figure.